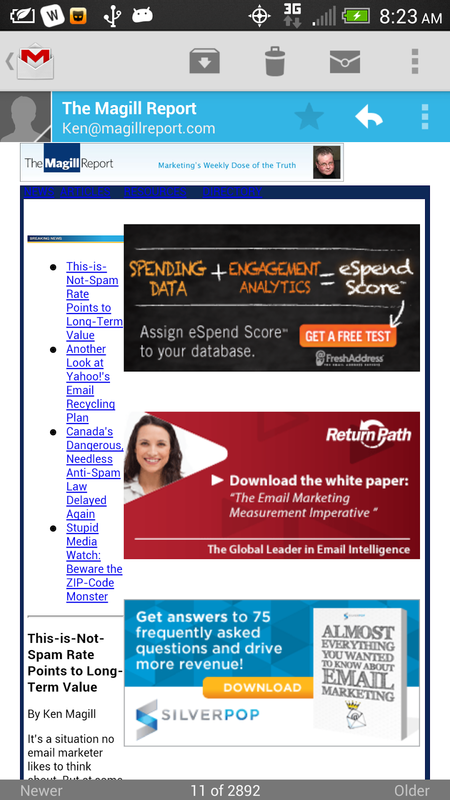 mobile optimization is the buzzword in email marketing - we see it everywhere and all of the esp's are even flooding the webinar space with meetings and how-to seminars on email mobilization. but, here is why i think that now might not be the time to start your company's moblization revolution... the gmail app. recently, gmail updated it's app for both android and apple devices, and it finally supports adaptive design (or responsive design). if you were ahead of the curve with mobilizing your emails, keep it up... but if you were waiting for insights into your subscriber base, you should probably hold off for a few more months on all of the work required to convert your existing templates to mobile adaptive ones. why you ask? well having just recently converted from an iphone 4s to an htc one, i was missing the way apple auto-scales html email. in an effort to mimic that, i discovered you can set up the gmail app on the droid devices to do the same thing - yah, no left and right panning anymore to get the full message in one screen. then the app threw me a curve ball... i subscribe to a bunch of emails, and found that some of them weren't displaying properly - it's the worst feeling in the world when your emails don't display properly and i feel that same pain when i see one in my inbox and i will often right back with pointers and help to correct the issue. but with these, it's the gmail app that is destroying the rendering. here is what i'm talking about. 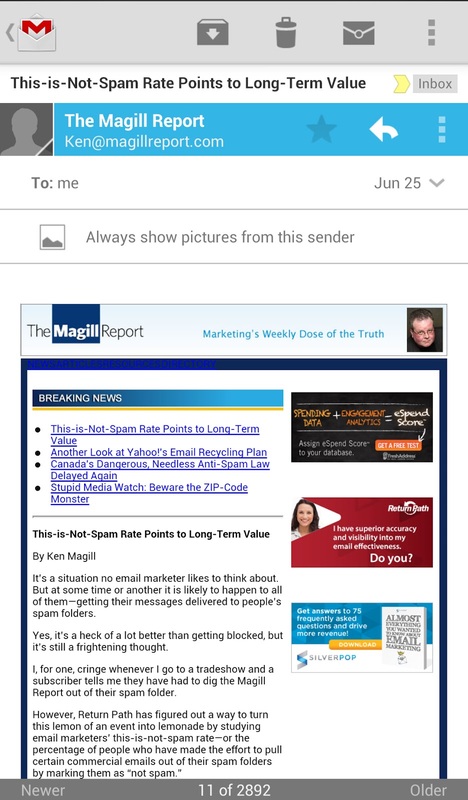 i got this email from the magill report. and you'll notice that the rendering is completely messed up. the images on the left are way too big, overlap other elements, and the headlines are compressed to a small left column. obviously this is a two column design, and adaptive to the device. it's a simple layout and when it renders properly, it's an effective way of communicating information to reader. when it shows up correctly, ken gets his message communicated in full and the reader can almost ignore the ads on the right because we've seen them before and typically readers pay more attention to the information on the left then they do the right. it's a proven template that works well. but because of the way that gmail supports adaptive design, this message displays oddly. and its not the fault of the app or the designer, this one falls on the reader. most people who jumped over to android devices to get bigger screens and less control over their devices still want the auto-scale feature, so they turned on that feature and forgot about it. 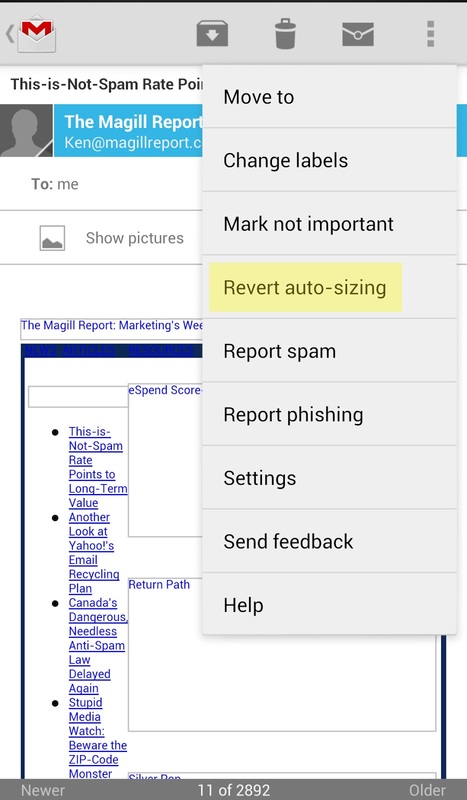 to fix this, you can either turn off the option completely - which then puts the reader in the position of having to pan across their emails - a screwed up user experience, or they can look at an email once it renders and then tap the menu and tap "revert auto-scaling". this fixes that particular email but most don't know that they can do that. the app itself while supporting adaptive design doesn't recognize it when certain customizations are turned on within the app. which can lead readers to think that message is messed up and that you're not an effective marketer, which will impact the message and the offer you're trying to communicate. here's the email "fixed" by turning off the auto-scale feature, but like i said it only impacts that one email - obviously once the reader discovers this option and fixes the first email, they'll begin to realize that they need to do it for each and every email - but that discovery phase is still a few months away i think, because people are quick to think that the email is incorrectly formatted and it couldn't be a result of google or my smartphone (a smartphone is only as smart as it's user, not the developer or manufacturer). that brings me back to my point, that right now is not the time to deploy adaptive emails - unless you're company was already doing it prior to the release of the new gmail app - even though it didn't support adaptive design prior to the release, you're organization had already invested the time and effort to build these templates. max width of 640pixels: this auto-scales 2:1, making your emails 320 pixels wide when they render on smaller screens (and when the auto-scale option is turned on in android devices). as more and more people begin to realize this issue, they'll search out the answer and they'll understand how to fix it and then we can kick in to overdrive our adaptive designs.